He was a famous painter and poet. 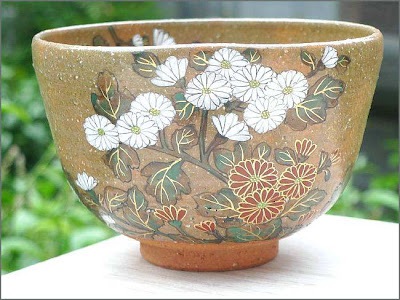 Born as the second son to a Daimyo family, he had the leisure to pursue painting. At age 37 he fell ill and became a monk at a temple belonging to the Nishi Honganji sect. He retired from his post at the temple in 1809 and lived in retirement at Negishi in Edo. 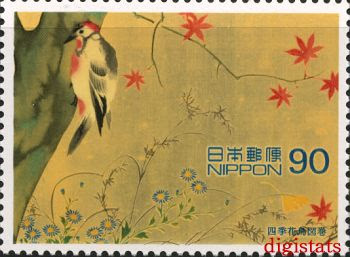 He also wrote poems, haiku and more sartirical kyooka and painted haiga. Japanese painter of the Rimpa school. 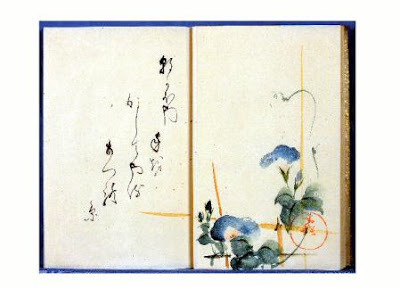 He is famous for reviving the style and popularity of Ogata Kōrin, and for creating a number of reproductions of Kōrin's work. Hōitsu was born in Edo; his father was the lord (daimyo) of Himeji Castle in Harima Province. The Sakai daimyō clan originated in Mikawa province. They claim descent from Minamoto no Arichika. ..... Moving to Kyoto, Hōitsu began his studies in art in the Kanō school before moving on to study under Utagawa Toyoharu of the ukiyo-e style. Among the paintings left by Sakai Hoitsu (1760-1828), a late-Edo-period painter known for reviving the Rinpa (or Korin) school of painting in the city of Edo, is a singular work entitled Kannon (i.e., the bodhisattva Avalokitesvara). hollyhocks, pinks, lychnises, hydrangeas, and lilies - have been arranged. In contrast to india ink paintings of Kannon, the flowers in Hoitsu's work are richly colored, attracting and holding the viewer's gaze. It is known that the creation of Kannon was connected to the hundredth anniversary of the death of Ogata Korin (1658-1716). Korin was the prime mover behind the earlier flourishing of the Rinpa school and the painter most highly regarded by Hoitsu, who donated the work to Korin's family temple, Myoken-ji, in Kyoto, where it remains today. It has therefore traditionally been inferred that Hoitsu "arranged" the flowers in the vase in commemoration of Korin's death anniversary and that he used summer flowers because Korin died in June. What has never been clear, however, is why the five flowers noted above were chosen ; indeed, Hoitsu's Flowers in a Vase, painted for the same anniversary, contains the identical five kinds of flowers arranged in a water jar. Hoitsu obviously had a reason for selecting them. In my paper, I will attempt to discern what Hoitsu's intended meaning may have been. The particular flower or bird, or the particular combination of flowers and birds, found in an Oriental flower-and-bird painting ordinarily has an auspicious meaning associated with it, one that the members of the painter's audience will usually be able to identify owing to their shared cultural experience. 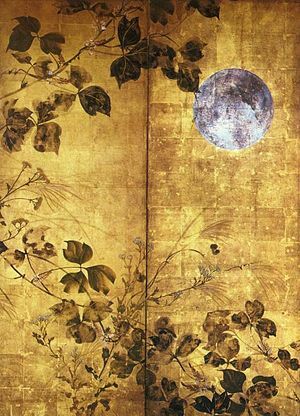 No traditional, specific meaning, however, can be discerned in the combination of the five summer flowers in Hoitsu's two paintings. 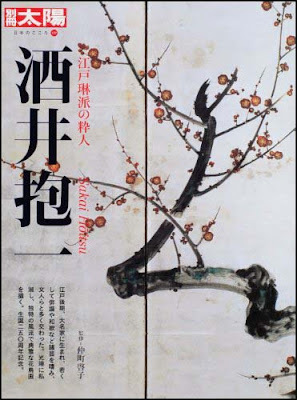 To unlock the meaning, I have investigated how the five flowers have been used in classical tanka and haiku poetry - in which Hoitsu himself was unusually well versed - beginning with the eighth-century Man'yoshu. For example, the combination of hollyhocks and lilies has traditionally meant, "We will meet in the next world" when it appears in classical poetry. I found other meanings for other groupings of the five flowers in question. 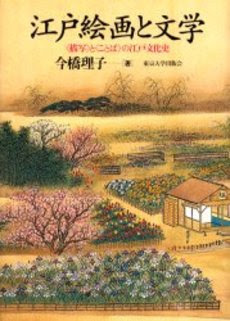 In the course of my research it became clear that Hoitsu clearly did not use the five flowers merely to commemorate Korin's death in the summer ; being familliar with Japanese history and literature, Hoitsu put together his combination with scruplous care in order to express the meaning he desired. Another point of interest is that Korin was particularly fond of the hollyhock and, in fact, replaced his family crest with one depicting a stylized version of this flower. This helps explain why, in Hoitsu's two paintings, the hollyhock is placed highest in the shin position, the all-important central position in traditional flower arrangement. Modern critics tend to view the beautiful flower arrangements in the paintings of the Rinpa school, including the two works discussed here, as random combinations. This evaluation focuses on the beauty of the paintings' form, but essentially denies their interpretive value. However, I believe that the surprising hidden meanings woven into the paintings of the Rinpa school are one of the greatest sources of the paintings' appeal. 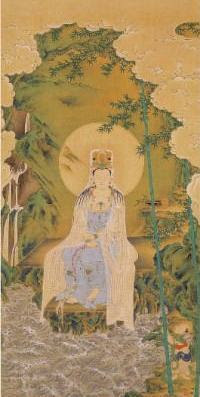 His painting of Kannon 観音図 - 観音像 is mentioned in the book. This poem is located in the sixth lunar month. Fireworks are often called the art of the ephemeral, but I'm not so sure about this. I wonder whether the love of fireworks really has anything in common with reverence for the cherry blossoms, though both scatter and fall bravely. One can certainly say, as Ogatsu Kyosuke did in his book "Fireworks: The Art of Fire", that "Fireworks blossom gorgeously in the sky and next moment fade away. It is this expendability that constitutes their beauty; the art of fireworks is an art of complete consumption in which nothing remains behind." No doubt many would agree. 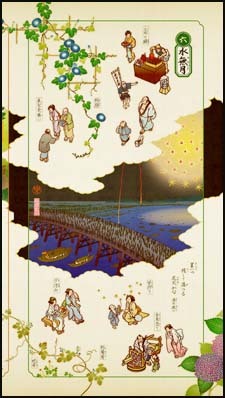 In Hoitsu's haiku, the falling fireworks are in the process of being expended, a process which is completed in a moment. The star that never fades in the night sky serves to confirm this. "Not a tattoo on the sky, the many-colored dots of fireworks permeate the night and are no more." It might have been the most bright star in the constellation of scorpius (scorpio), Antares, who appeares red in the night sky. Antares is the sixteenth brightest star in the nighttime sky.